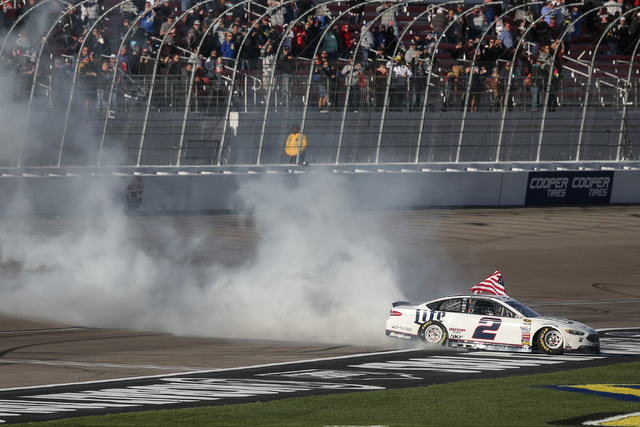 Brad Keselowski certainly exists among those elite talents who on any weekend can be the one to park at Victory Lane, but it had been awhile since the 2012 Sprint Cup champion had ripped up burnout doughnuts on the infield after winning a race. Say what you want about NASCAR’s new aerodynamic package, all that stuff about shorter spoilers and radiator pans and changes to the splitter to create less downforce, but this part rarely changes: The best drivers adjust and conquer. The same ones tend to always run up front. Cinderella is for March Madness, not the NASCAR Sprint Cup Series. 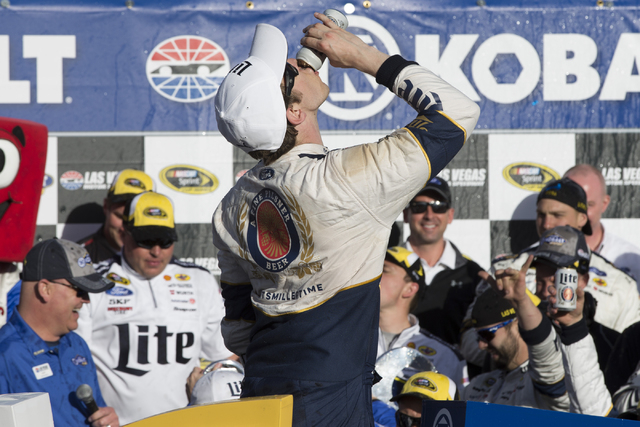 Brad Keselowski certainly exists among those elite talents who on any weekend can be the one to park at Victory Lane and spray the raucous crowd with a sponsored beverage of choice, but it had been awhile since the 2012 Cup champion had ripped up burnout doughnuts on the infield after winning a race. 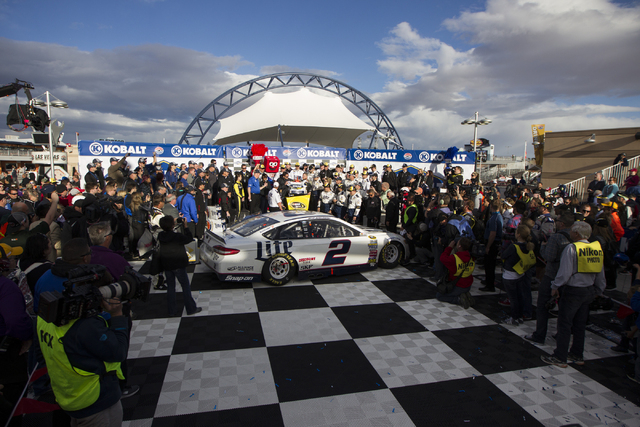 Keselowski did so Sunday at Las Vegas Motor Speedway, winner of the Kobalt 400 after passing Las Vegas native Kyle Busch with five laps remaining on a day that made as much news for the weather as anything that occurred on the track. He last did so at Fontana in March 2015, then spent the next 33 races before Sunday wondering when he again would be the first one to cross the finish line. 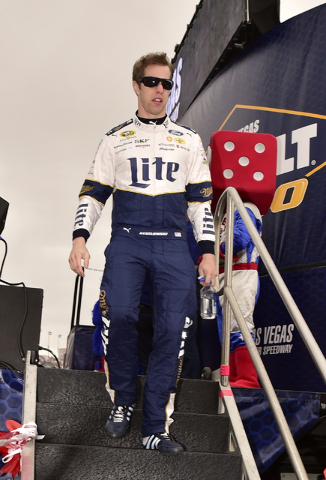 Keselowski has now won two of the past three Sprint Cup races in Las Vegas and hasn’t finished below seventh in his past four trips to LVMS. This one was by far the trickiest and most bizarre. The new package is designed to produce more side-by-side racing and passing of others. Some cars are proving really good on short runs because of it and others better on long runs. 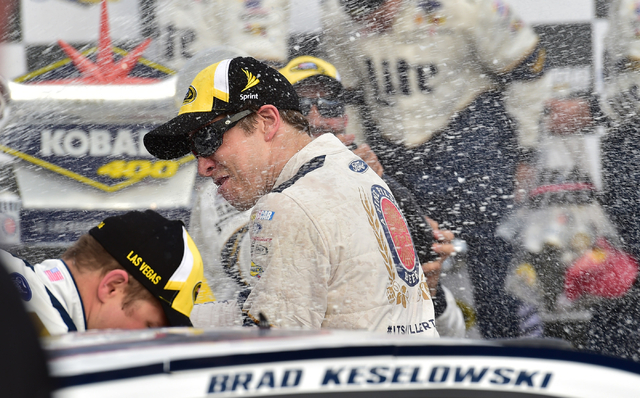 Keselowski was part of the latter group Sunday. But he received a penalty for speeding early, then gambled on fuel late to win, all the while dealing with weather patterns of light rain and winds whipping at 50 mph and a dust storm that rose on the outskirts of the track. Scattered debris flew into the grills of several cars. It was a little crazy. 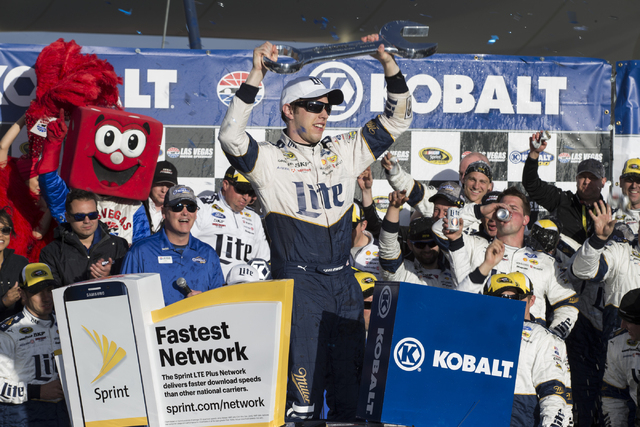 Keselowski, who clinched an early spot into this year’s Chase with the win, crossed ahead of fellow Penske Team member Joey Logano, which is sort of the opposite of what happened last year. 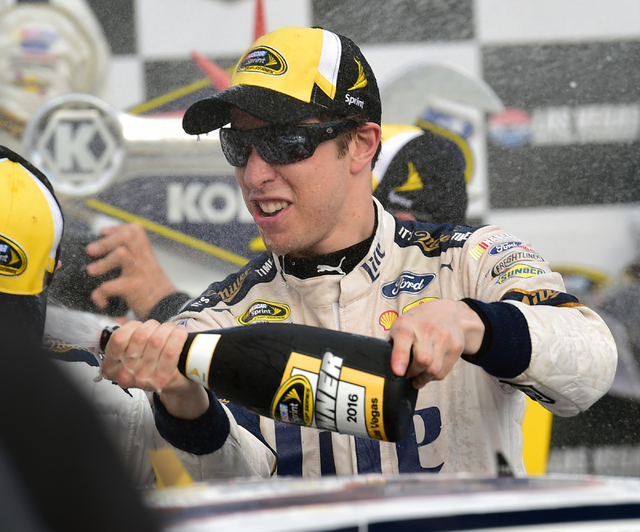 Logano won a series-best six times in 2015 while Keselowski came up short over and over, ending the season with nine top-five finishes, including runner-up five times. They did and they didn’t and then they did when it mattered most Sunday for the winner. 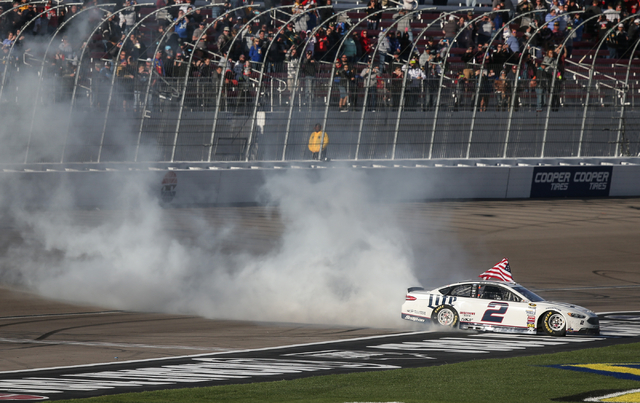 Keselowski fought like crazy to pass Logano and then easily tracked down Busch, whose car had wheel issues down the stretch that cost him a hometown victory. He finished fourth. The downforce package targets tracks like Las Vegas Motor Speedway, and was in large part created to give drivers more control of the car while making things faster into the corners, all of which officials believe could produce more exciting finishes. It also means new types of tires, which should lead to more passing. 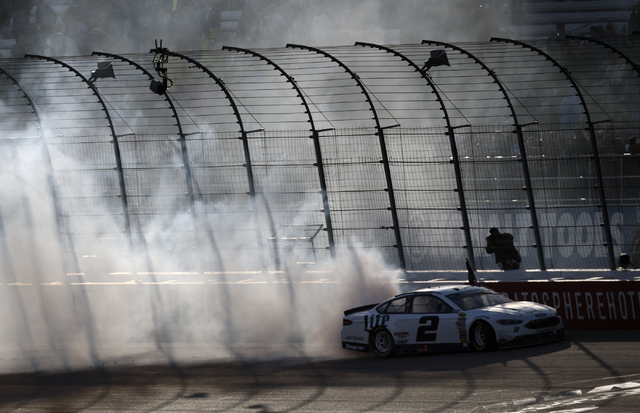 “The challenge for NASCAR is we have all these race teams spending millions of dollars to develop the aerodynamics on cars because there is such a competitive advantage to finding more downforce,” Keselowski said. 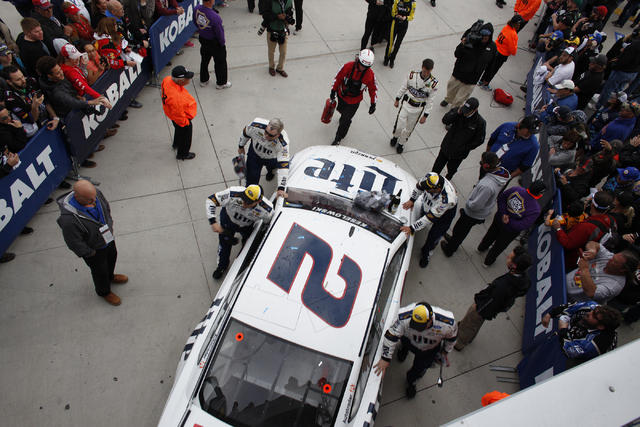 “The challenge for NASCAR is to stay ahead of that with segments and changes, knowing teams will continue to develop. It’s a lot of stuff about spoilers and radiator pans and splitters on the cars, and a lot of stuff for drivers about balance and precise footwork and accuracy and where to place the car and how to place it and racing others sideways. But one thing doesn’t change: The best ones adjust and conquer. 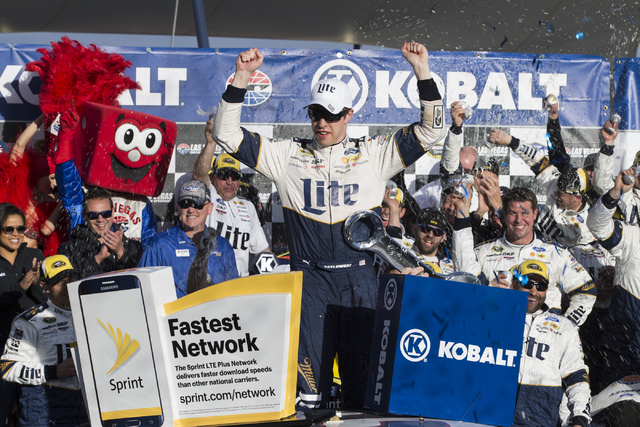 It took Brad Keselowski almost a year to know that feeling again, but when you exist among the sport’s elite, such a drought hardly requires directions to Victory Lane or on how to execute those burnout doughnuts.